One of the advantages to this type of classroom is that it is individualized. Even the assessment can be differentiated. I may have different expectations for different students even though they have both chosen the same assignment. Although each student is expected to meet the objectives, the modality of expression or depth of understanding may vary. Individualized education should no longer be delegated to only those students in special education. All of our students deserve an individualized program. Since all students begin their learning experience at various levels, the emphasis should be on personal growth from the individuals starting point. Oral defense of assignments becomes an important opportunity for me to evaluate, clarify, and offer additional instruction. These one-on-one conversations allow me the freedom to modify or individualize the students evaluation. It takes only a minute or two with each student to assess learning. The tradeoff for many students is that this presents a much less stressful assessment than a formal test. Once Ive discussed the assignments with them personally, I often feel no need to go back later and give them a paper and pencil test. Most students prefer these oral assessments. After we have discussed an assignment, I initial the assignment on their unit sheet and put the points they received next to it. It is the students responsibility to keep up with their assignment sheets. 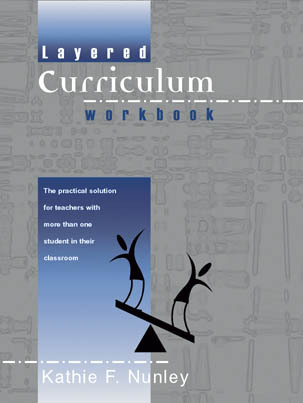 There are a few extra benefits Ive found to running my classroom using Layered Curriculum. Students rarely complain to me anymore about doing a particular assignment. Since all assignments are of their choosing, if it turns out to be boring or unenjoyable they have no one to blame but themselves. One idea I've used is to make a list of students who need assignments graded as they enter the room. They simply call out their name as they enter and I write it down. When the tardy bell rings I draw a line at the bottom of the list. I guarantee to get around to those names on my list, but if you come tardy there are no guarantees. I may or may not get to them that day. This has greatly cut down on tardy students. The bottom line - you CAN reach all the varieties of students that sit in your classroom. You can accommodate the lowest ability level while providing a stretch for your highest ability level students. In many traditional teaching methods, the material is easy for some, difficult for others, and impossible for a few. This differentiated instruction allows the lesson to be structured in such a way that everybody learns something. It doesnt marginalize students entering with less preparation or ability. Everyone makes progress. Because everyone wins, the students feel they are benefiting from the lesson.. The teacher wins by having involved students that actually learn. And all of it happens under the control of each student. Your role as teacher is as a facilitator and a coach to help each student reach their individual potential.